Sunday morning, Steve and I debated what to do with the day. Nothing was on the schedule. Instead of lazing around in the house, we decided to take a spontaneous adventure. It was too hot for the city or the beach. The town swim club wasn't interesting. We decided to go find a lake to jump in. 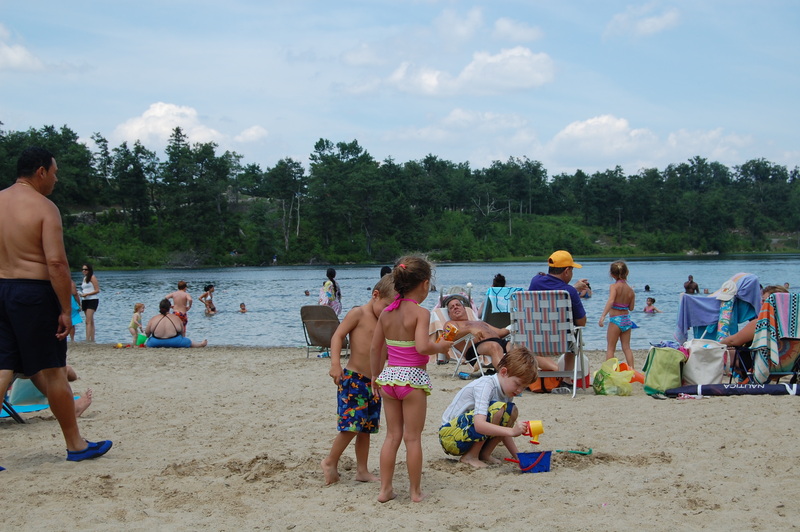 We quickly did a little research on the Internet and found a public beach at Lake Hopatcong, which is about an hour from the house. Forty minutes later, we were on the road with towels, bathing suits, and bag of digging tools for the sand. We arrived at Lake Hopatcong at 10:30, however state troopers had blocked off the entrance to the park and were angrily waving people away. The park was already filled to capacity. We pulled over and asked the trooper where to we should go. He shrugged and yelled at us for impeding the traffic flow. 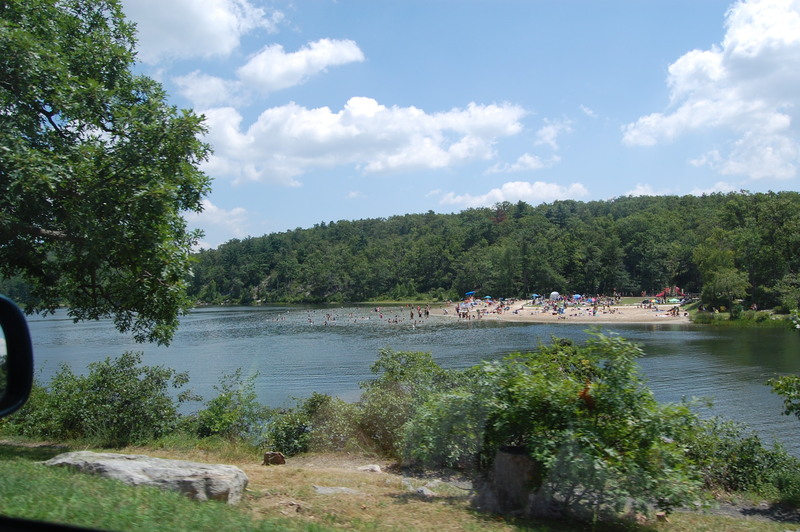 Other than that one public beach, the rest of Lake Hopatcong was reserved for private residents. We drove away and I furiously searched for another public beach on my iPhone. Steve remembered that there was supposed to be a lovely lake at High Point State Park, which is in the northwest corner of the state. We reset the GPS and headed northwest. 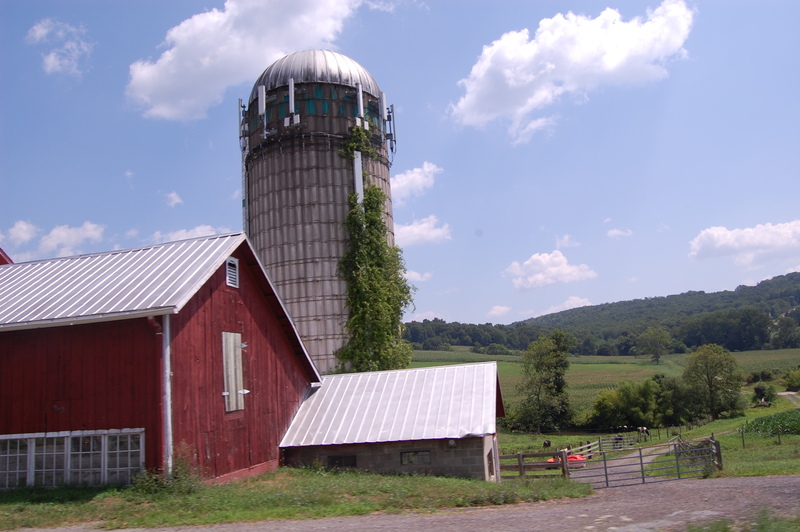 We wound our way through rural highways of New Jersey past antique shops and farm stands. Some towns were cleaned up with money from vacationing New Yorkers. Other towns were sagging and depressed. It took us another hour to get to High Point, which made for a longer adventure than we had planned, but the kids amused themselves in the backseat. Jonah read three chapters of a Harry Potter book, and Ian counted gas stations, which are his latest obsession. We paid $10 for parking at the park and briefly chatted with a smart, young girl who worked for the Parks Department. Steve thinks that the best and brightest college grads are working for the government right now, because that's the only sector that is hiring. We changed into our suits at a stony bathhouse by the lake. Not totally clean, but it had paper towels and toilet paper. 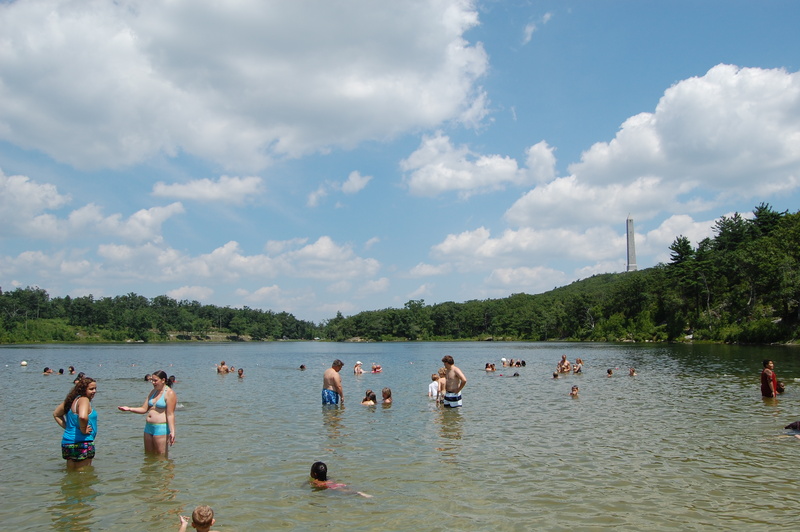 The park was packed with extended families grilling ribs and hotdogs at camp sites surrounding the lake. We hadn't brought food. Our plan was to take a quick swim and then find a burger joint on the way home. We wound our way past the grillers to find a nice place by the water. The boys dropped the bags and went running headlong into the water. It was warm from the weeks of 90 degree weather, but there was a cool breeze in the air. It was much better than frying up like bacon at the Jersey shore. After a dip in the water, the boys concentrated on making sand creations. Other kids came by to chat. There was a nearby playground to amuse them and a snack bar a few feet away. After a couple of hours, we had to head back home to get ready for the workweek. Another smart young Parks Department official asked us if we were going for the day as we pulled out of the parking lot. There was a line of cars waiting to come in. This park was also filled to capacity. With the downturn in the economy and this record heat wave, people are leaving the cities to use the public parks. It's an affordable getaway for people who don't have swim club passes or beach homes. Instead of blowing $100 at the Jersey shore for parking, food, and beach passes, we spent $10. My kids were surrounded by a snapshot of the entire state, rather than the regular group of families at the town swim club. However, public parks, like every other vital service in this state, are under pressure from Governor Christie. With the long line of people needing relief at our public parks, we really should be putting more public money into parks, rather than coming up with schemes to save money. It says something about me, doesn’t it that every time I hea about ian’s latest obsession I want to know what the answer was. I think there should be more park services, and I really want there to be beautiful stone benches and changing houses built by ARRA funds. But I do worry that we really haven’t figured out where money will come from, not now (when I do think deficit spending makes sense) but eventually. Stone benches—brrr. In other parts of the world, old ladies warn young ladies not to sit on those on cold days. You’ll freeze your ovaries, you know. Ian will recite all the gas stations that we’ve passed on the highway: Hess, BP, Exxon, Liberty, Delta. He’ll also quiz us about the features at each gas station. Example: What’s the name of the gases at Exxon? Answer: Regular, Plus, and V-Power. He says “V-Power” with particular gusto.